Transparency Market Research (TMR) has published a new report titled, “Head and Neck Cancer Market - Global Industry Analysis, Size, Share, Growth, Trends, and Forecast, 2018–2026”. 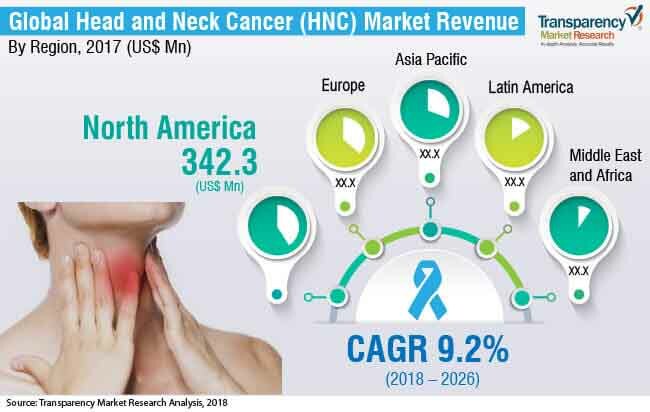 According to the report, the global head and neck cancer market was valued at US$ 933.3 Mn in 2017 and is anticipated expand at a CAGR of 9.2% from 2018 to 2026. Growth of the pharmaceutical industry, government initiatives, increase in health care expenditure, surge in product approval, and rise in patient population are projected to augment the global market from 2018 to 2026. Cancers of the head and neck are categorized depending on the location. These areas include oral cavity, pharynx, larynx, paranasal sinuses & nasal cavity, and salivary glands. Increase in consumption of alcohol and tobacco is a major cause of head and neck cancer. An estimated 75% of head and neck cancers is caused due to consumption of alcohol and tobacco. Increase in the number of head and neck cancer patients across the world is anticipated to drive demand for therapeutics. According to the American Society of Clinical Oncology (ASCO), head and neck cancer accounted for nearly 4% of all cancers in the U.S. in 2017. Moreover, nearly 65,000 individuals will develop head and neck cancer in the near future. Drug class such as anti-PD-1 monoclonal antibodies is routinely used in the treatment of head and neck (HNC) cancer. The global head and neck cancer market has witnessed an increase in new product approvals in the past few years. This is anticipated to propel the global market and provide lucrative opportunities during the forecast period. For instance, in November 2016, Bristol-Myers Squibb Company announced the U.S. Food and Drug Administration (FDA) approval for Opdivo (nivolumab) injection for intravenous use in the treatment of patients with recurrent or metastatic squamous cell carcinoma of the head and neck (SCCHN). Rise in scientific and technological advancements in R&D and manufacturing processes is expected to increase the efficiency of drug development. However, a significant number of clinical trials fail to meet desired results. This acts as a major restraint of the global head and neck cancer market and in turn limits the entry of new players. For instance, in 2017, phase 3 trial designed to evaluate pembrolizumab for the treatment of patients with recurrent or metastatic head and neck squamous cell carcinoma failed to meet its pre-specified primary endpoint of overall survival. In terms of revenue, the head and neck cancer market in Asia Pacific is projected to expand at a CAGR of 10.2% during the forecast period. Rapidly increasing patient population in the region is expected to boost demand for therapeutics for the treatment of head and neck cancer, which in turn is likely to drive the market from 2018 to 2026. Growth of the biopharmaceutical industry and government initiatives in the region are anticipated to provide lucrative opportunities for manufacturers in the next few years. According to the Indian Council for Medical Research (ICMR), 90% of oral cancer patients in rural areas belong to the lower or lower-middle socio-economic class. The report also provides profiles of leading players operating in the global head and neck cancer market. These include Sanofi, Pfizer, Eli Lilly and Company, Merck KgaA, Bristol-Myers Squibb Company, Bayer AG, Galera, Fresenius Kabi, and Teva Pharmaceuticals. Increase in mergers & acquisitions, strategic collaborations, and new product launches are expected to drive the global market during the forecast period. In July 2018, Merck announced the phase III trial for KEYTRUDA (Pembrolizumab) anti-PD-1 therapy for first-line treatment of recurrent or metastatic head and neck squamous cell carcinoma (HNSCC).